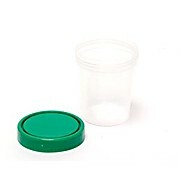 Disposable sample collection have standard 4 oz fill capacity and graduations in oz and cc (mL). Leak resistant. Available in sterile and non-sterile.